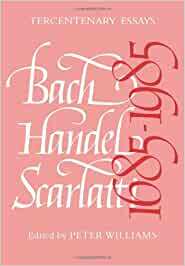 Buy Bach, Handel, Scarlatti Tercentenary Essays 1st by Peter Williams (ISBN: ) from Amazon's Book Store. Everyday low prices and free delivery on eligible orders. Available in the National Library of Australia collection. Format: Book; xiv, 363 p. : ill. ; 26 cm. Bach, Handel, Scarlatti, tercentenary essays. edited by Peter Williams. Cambridge ; New York : Cambridge University Press, 1985. xiv, 363 pages : facsimiles, music ; 26 cm.